Carmen, Alexa and I went to La Taquiza for dinner. 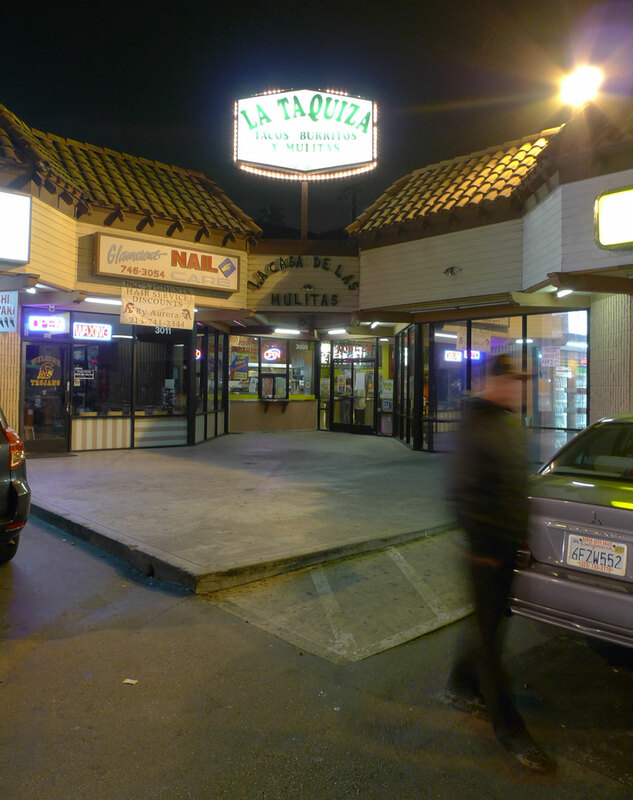 La Taquiza is near the USC campus, and clearly a student hangout kind of place, but a pleasant enough environment. In addition to tacos and burritos and other standard fare, they highlight something called a “mulita”, which is a sandwich of cheese, meat, and aguacate between two little handmade tortillas. I ordered three tacos, chicken, al pastor, and carne asada. They were $1.58 each. 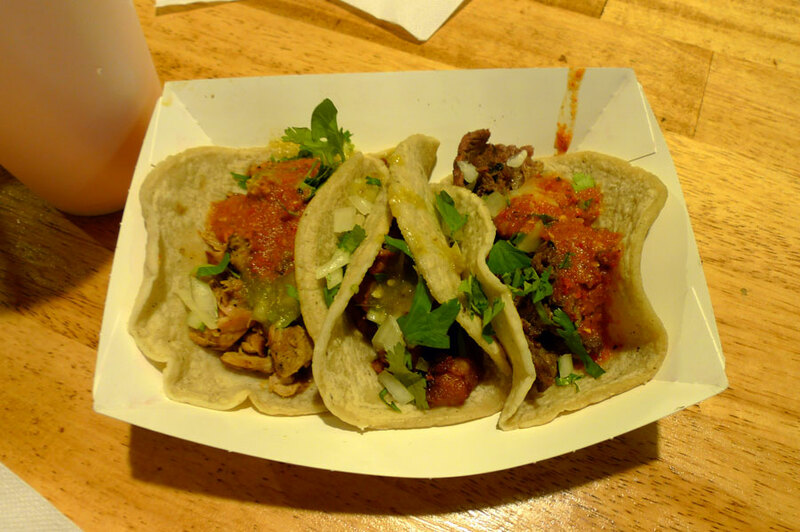 They were about average in size, and served as only meat on tortilla – application of salsa, onions, and cilantro left up to the end user at the salsa bar. The tacos were served immediately upon ordering, with no reheating, grilling, or special preparation. The handmade tortillas were impressive. Not least of all, because they were of very uneven thickness – one side of the tortilla nearly twice as thick as the other! This asymmetry is of course, pleasing, exemplifying the handmade nature of the product. They were good with good feel, and above average for taco tortillas, but slightly clammy and doughy – I think they would have benefited from additional toasting or grilling immediately prior to serving. The carne asada was very good, a bit chewy and meaty in a steaky way. The red salsa from the salsa bar, on the other hand, was a disappointment. It tasted fishy! The green salsa was good, though. The al pastor, from a revolving spit featured prominently at the front of the restaurant, was extra flavorful, with unusual tomato flavors. It had so much flavor that the addition of salsa is optional. The chicken taco wasn’t bad, but kind of meh – I think it would go better in a burrito. On my next visit, I think I’ll try an al pastor burrito, and maybe the suadero taco, now that I know what that means.